Team Green™, Kawasaki’s amateur racing support program, today announced the payout schedule for ATV racing in the 2005 Grand National Cross Country (GNCC) racing series. 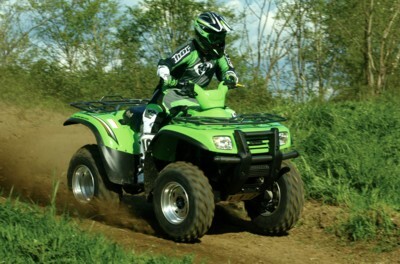 As part of the comprehensive program announced in early February 2005, the ATV racing contingency program provides Team Green rewards for wins and high-place finishes in the highly competitive GNCC series. In order to qualify, riders must compete on a 2005 Kawasaki Brute Force™ 750 4x4i, Brute Force 650 4x4, Prairie® 700 4x4 or KFX®700 ATV. Included in the new program is online registration, rewards that are deposited directly to a new MasterCard debit card for Team Green riders, and the ability to redeem the rewards not only at Kawasaki dealerships, but to make purchases at more than 32 million retailers worldwide. To simplify and speed the registration process, ATV racers can now go online at www.kawasakirewards.com\TeamGreen. In addition, new MasterCard Team Green Rewards debit cards are issued to contingency winners, and deposits are made daily once Kawasaki Team Green receives and approves official race results from race promoters. Reid Nordin, manager of Team Green, said that while Kawasaki is not fielding its own team for the 2005 GNCC season, the brand remains committed to providing its loyal customers the assistance they need to pursue successful racing careers. Nordin noted that in 2004 alone, Kawasaki ATV racers backed by Team Green clinched three GNCC titles, and included well-known champions such as Mike Penland, Scott Kilby and Doug Henke. Racers are encouraged to visit their participating Kawasaki dealer for more details. Information is also available by calling Team Green at 949/770-0400 ext. 2633 or visiting www.kawasaki.com.